Jun 03, 2016 Wesbank, Car, Sales, Dealership, aftermarket, economy, business. 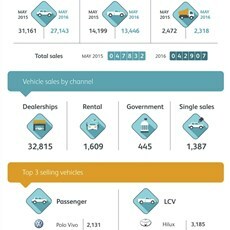 South Africa’s new vehicle market continued to decline this past month, with total industry sales of only 42 907 new vehicles sold – a 10.3% fall. Within this, respective drops of 12.9% and 5.3% were seen for passenger cars and light commercial vehicles. Sales through the rental channel have started to normalise, after seeing significant growth during the first months of 2016. Rental sales in May were down 5.9%, however this channel’s year-to-date growth is still at a healthy 48.7%. New vehicle sales through the dealer channel remained relatively robust, ending the month at 2.5% down on the same period last year. This was largely as a result of pent-up demand for new arrivals in the Light Commercial Vehicle (LCV) segment. 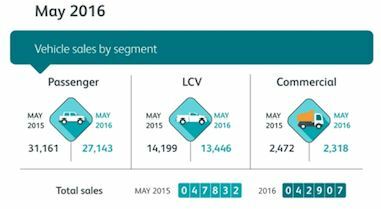 LCV sales through the dealer channel grew 15.4%, year-on-year. WesBank’s own data reflects the performance in the dealer channel. Consumer demand for credit remains robust, with new vehicle sales applications down by only 0.2% in May. However, the continued shift to the used market is evident. The weaker Rand has resulted in continued new car price inflation and this has caused consumers to shift to the used car market. Consequently, demand for used cars – as measured by application volumes – grew 9.5% in May. These supply demand dynamics have subsequently seen used car prices increase and in May the average transaction value for a used car financed through WesBank grew by 7%. WesBank’s forecast for 2016 sees total industry new vehicle sales declining 12% for the year. This will also be fuelled by changes to the interest rate and higher living costs faced by consumers. This year the interest rate has been hiked by 75 basis points, while petrol and diesel prices have risen 7% and 12%, respectively. Wesbank, Car, Sales, Dealership, aftermarket, economy, business.